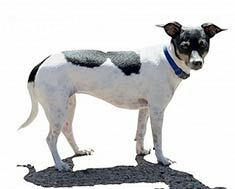 Compact muscular dogs with strong legs and shoulders but with tiny heads, Rat Terriers are born with long or short tails which may be docked shortly after birth. The Rat Terrier originated in England. Rat Terriers can be various color combinations including red and white, tri-spotted, solid red, black & tan, blue & white and red brindle. The Rat Terrier's short smooth coat is easy to groom. Rat Terriers are spunky and lively and require lots of exercise. They can also be quite vocal during playtime. Good with both children and the elderly, Rat Terriers make excellent watchdogs. Rat Terriers have few known health problems. The Rat Terrier can be expected to live about 15 to 18 years. Rat Terriers will do okay living in an apartment. However, they are active dogs and require plenty of exercise. They love to dig and will dig themselves out of a fenced yard. Find Rat Terrier Puppies with our Free Breeder search!